Last night we talked about one of my favorite subjects to photograph. Another one is reenactments. I try to make it to as many as possible every summer. This year is the 150th anniversary of the Battle of Gettysburg. If everything goes right I’ll be there for the reenactments this year. This post is a photo of a group of British Soldiers having a cup of coffee and relaxing. 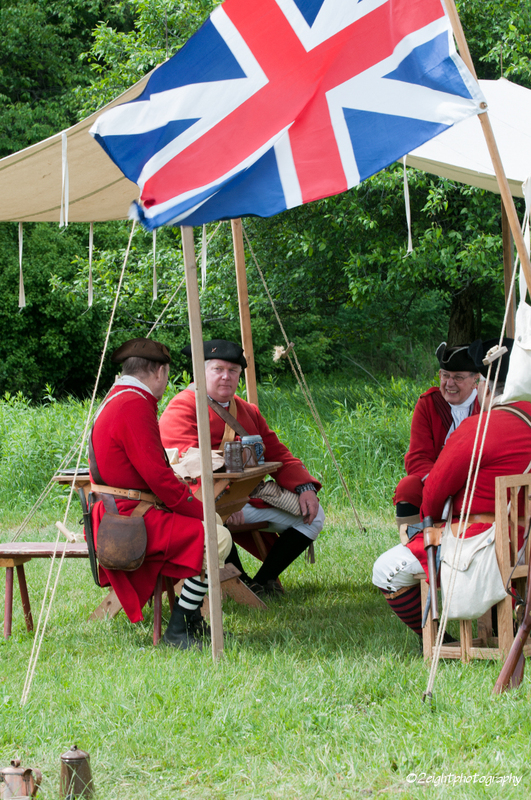 This was taken at a reenactment at Fort Necessity National Battlefield in Fayette County, Pa. Author Brian KloockPosted on April 30, 2013 Categories Digital, Interesting Groups:Tags british, digital, digital photography, fort necessity, fort necessity national battlefield, Photo, photography, photos, postaday, reenactments, soldiersLeave a comment on The British Are Coming…. Well it’s been a while since I had a photo assignment. So I think it’s time I start that back up again. Sometimes making yourself an assignment can get the creativity flowing and get you out and about to do a little photography. Check back later to see what I was able to some up with. Things you see when your out and about…..
As a photographer I often leave the house with a preconceived notion as to what I’m going to photograph. For me this is one of the hardest things to work around. Reason being, very often I don’t look at the many other photographic opportunities that are just around the corner. I know this is a problem, so lately I have been trying hard to work around this issue. So, yesterday I had the opportunity to take a ride through the mountains around my area. I wasn’t looking for anything in particular, just went for the ride and stopped and took a few photographs along the way. I found the day to be very rewarding and was able to get a few neat shots. I would appreciate any comments about the photos. Author Brian KloockPosted on May 29, 2012 Categories Digital, Interesting Groups:Tags angel, arts, cemetery, cows, cross, neat shots, photography, photos, snail, water, windmills2 Comments on Things you see when your out and about….. Recently the photography group that I belong to took a trip to the Pittsburgh Zoo and PPG Aquarium. I’ve ben there several times in the past, but each time I manage to find a different view, expression, or animal to photograph. So if you have time this summer plan a trip to the zoo and have a nice day out. Let me know what you think of the photos. For those of you that know the Pittsburgh area you would already know that we love our sports teams, Primanti Brothers, and Fireworks. We seem to have fireworks for every occasion and the end of a Pirates baseball game is no exception. On Saturday night the Pirates played the Phillies, winning in the 10th inning 2-1, and afterwards the display of fireworks took place. I was atop Mt. Washington for the display and here are just a couple of the shots that I got from my vantage point. Hope you enjoy. Some of you may have noticed that I have a fascination with abandon buildings and houses. Now I am adding industrial sites to the mix as well. The shots in this post were taken at the Nemacolin mine in Nemacolin, Pa. Nemacolin mine was in operation from 1917 through 1985-6 when it was closed for good. In 1919 Nemacolin mine was considered to be the largest coal mine in the country. The town, built by the coal company, had a theater, tennis courts, amusement hall, and a swimming pool. They also had their own hospital and elementary school, both of which have gone by the way side. It was said that the town was considered to be the model mining town in the country and the mine was considered to be the model mine for the entire world to look towards. To give you an idea of how advanced the town was, in 1917 the town had its own sewage treatment plant. On a personal note, two of my family members worked in this mine. My grandfather worked in this mine his entire coal mining career. I was not aware of this until after visiting the mine and taking the photographs. I was talking with my mother and had mentioned that I was at that mine taking photos. She got really excited and told me the story of how she would go with my grandfather on Saturday mornings to pick up his pay check. They lived across the river, in Messmore, and would drive to the Nemacolin ferry and cross over to the mine to pick up his check. She also told me of the stories that my grandfather would tell about walking out of the shaft when there would be a problem in the mine. Apparently if there was a problem or the electricity would go out the miners would have to walk a set of steps from the bottom of the mine up the entrance shaft. The other member of my family that worked there was my father. He worked there a short period of time until transferring to the Buckeye mine in Carmichaels Pa. She also told me that the miners were able to travel underground between the two mines, which are approximately 2-3 miles apart. For the photographers reading this the are all HDR photos processed using HDR Efex Pro. I hope that everyone enjoys the photos and the short history lesson about this mine. Feel free to leave comments and ask questions. Recently on my way home I was watching an approaching storm. The more I watched the storm the more I became interested in photographing the lightning. I thought for a bit and then remembered a great place where I could get on the top of a hill and get a good view of the storm. In all the years I have been taking photos this is the first real attempt at lightning and I was pretty surprised at the results. I know after this experience I will be watching for more opportunities to photograph lightning in the future. I hope you enjoy these three photos.